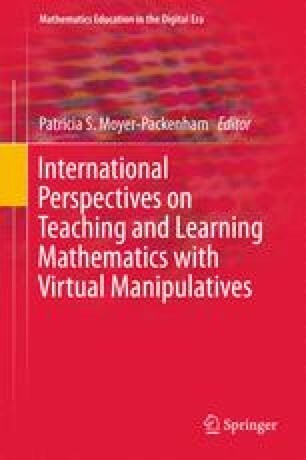 It is a challenge to analyze the design and the use of Virtual Manipulatives due to their high complexity. As it is possible to create entirely new virtual worlds that can host objects that behave differently than any real objects, allowing for new and unprecedented actions in learning processes, we are in need of tools that enable us to focus on those aspects that are important for our analyses. In this chapter we show how ACAT, Artifact-Centric Activity Theory , can be used to analyze the design and use of a virtual manipulative place value chart. Kortenkamp, U. (2015). Place value chart. Available in the iTunes-Store: https://itunes.apple.com/de/app/stellenwerttafel/id568750442?mt=8. Last opened on September 3, 2015.